My computer is i7 4790K + MSI Z97 GD65 + 16gb DDR3 2400 GSKILL + Radeon HD 7970 Sapphire + Monitor BENQ XL2720Z. I installed Windows 10 PRO 64bit in my computer, and i installed lastest Catalyst driver 15.7.1 for windows 10 version. The driver is bugged, GPU SCALING IS NOT WORKING TO FULL SCREEN !!!! On CCC, i enable "gpu scaling" and configure it to "scale to full screen". When i try run Starcraft Broodwar, it dont works on full screen. I uninstalled Catalyst 15.7.1, and i tried 15.8 beta, and still not works. I tried 15.7 version too, same problem. CATALYST CRIMSON EDITION 15.11 FIX THE BUGS!!! Ah, good old Brood War... I played the heck out of that back in the day. Lurkers for the win. check the "run in 640 x 480 screen resolution"
and check the "disable display scaling on high DPI settings"
Please let us know how you do with that. tried. dont works. starcraft dont works on FULL SCREEN. i tried uninstall catalyst 15.7.1 driver, so, i installed 15.8 beta, still dont works. But i have a original windows 10 pro, i want run starcraft broodwar on full screen. Well. I still dont have a solution. I tried change monitor to a LCD 22", dont works. Yesterday, i downloaded "MediaCreationToolx64.exe" from microsoft. So i got the the original Windows 10 PRO 64bits ISO, with July 2015 updates. I burned the DVD. I formated my computer to install this new Windows 10 PRO 64bit (updated).... so i installed Catalyst 15.7.1 for w10 version, and still DONT WORKS. I reported this issue, 2 times, in amd driver download page, weeks ago. They never answered. Im disapointed. Im thinking seriously in sell my radeon 7970 and buy a geforce. Let me do a little more research into this one. I'm not certain switching to Nvidia is going to solve this problem for you. Please give me a bit to reply. im glad for your help. I am not a novice technician. i have experience. i fix computers since 1999, i work with it. i formated my computer 7 times, a lot of tests, and no success. my monitor is a BENQ XL2720Z. Im using windows 7 in my computer now, with catalyst 15.7.1, gpu scaling is working. But my windows 7 is not original, not activated. My brother give me a Windows 10 original cdkey FPP (permanent) as a gift in my birthday, you know its expensive... i want use windows 10, but i play starcraft broodwar a lot, and i want to run it on full screen in my computer in windows 10. I know i dont need a radeon 7970 for play starcraft broodwar, but i play starcraft 2 and battlefield 4 too, and i want to play in dx12. I dont want stop to play starcraft broodwar, i play it with my friends. When i disable my radeon 7970 in windows 10, and i use my onboard vga Intel HD Graphics, i install the intel hd graphics driver for win10 AND STARCRAFT WORKS IN FULL SCREEN PERFECTLY!!!!! When i uninstall Catalyst driver on windows 10, i restart computer, and the vga driver become "Standard microsoft vga driver", with this generic driver, STARCRAFT WORKS ON FULL SCREEN!!! I understand your frustration. I may see if I can find my old copy of BroodWar and load it up to try and replicate the issue tonight. in my tests, i tried to install windows 7 and upgrade to windows 10, 2 times. No success. i tried to install windows 8.1 and upgrade to windows 10. No success. i downloaded the windows 10 ISO from microsoft, with the microsoft media creation tool for windows 10. With it, i can download the lastest windows 10 PRO 64-bit iso, with JULY 2015 updates, so, i burn the DVD, and install by dvd. No success too. Once all of the above are installed, reboot. Next, select AMD install manager and 'custom uninstall' the graphics drivers and CCC only. In safe mode run DDU uninstaller for both AMD and Nvidia drivers. Install the new driver suite. 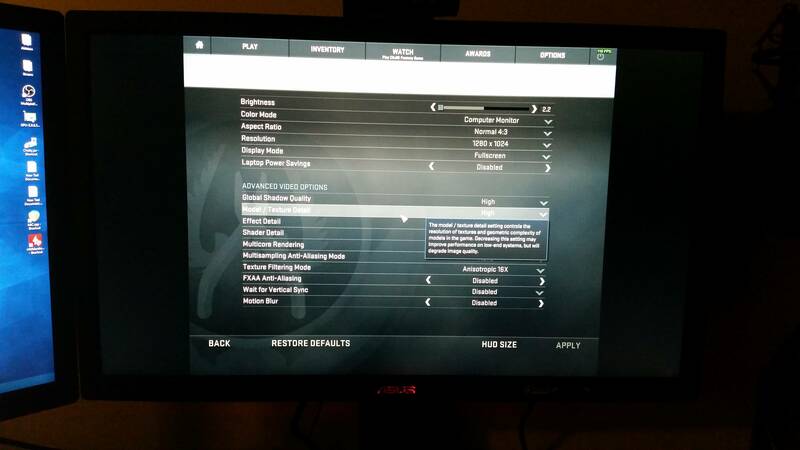 Adjust the GPU scaling option and test. i already have the lastest version of DDU from the old guru3d website. ddu clean all files and register folders/keys/values of catalyst drivers on windows. in all my tests, i used DDU to uninstall and test a lot of windows 7 / 8 / 8.1 drivers versions on windows 10 (and for beta windows 10 drivers too). all my tests didnt works. when i installed a different O.S. driver version on windows 10 (7/8/8.1), i install setting directory manually, so i have no uninstaller, so i need DDU. I prefer DDU than catalyst uninstaller. Theres nothing wrong in what i do. im hardling trying solve this for 2 weeks. The problem is the driver man. Catalyst is the problem, its BUGGED. The scaling gpu option doesnt works properly. The "scale to full screen" option works like "maintence aspect ratio".... these 2 options is working in same mode. Its an error. The "scale to full screen" option is bugged on windows 10, but it works on windows 7 version. "its simple". I reported this issue in amd download page 2 times, but they dont listen me... im ignored, this error dont appear on "known issues errors" when i see "catalyst 15.9.1 whats new". the only way is amd fix the driver error. Are you a forum moderator / administrator ? Can you tell them to fix this error? Thanks, im glad for your attention and patience. I am no mod or admin, but I can try to get confirmation for you. Will pass it along. Secondly, the game you are referring to is from the year 1998. Quite honestly, I do not believe we can devote any resources to a game title, released over 17 years ago. This is a Windows 10 issue, not a Catalyst issue, Nvidia is having the same problem. You guys are making this harder than it needs to be, it is quite clear in the pictures below. CS:GO is set up as a 4:3 resolution, CCC is set up to "Scale image to Full Panel Size"
1) in windows 10, if i uninstall CCC, when i restart computer, the driver will become a "microsoft standard vga driver".... with THIS DRIVER, starcraft WORKS ON FULL SCREEN. 2) if i use my onboard vga intel hd graphics instead my radeon hd 7970, it works on full screen (on windows 10). 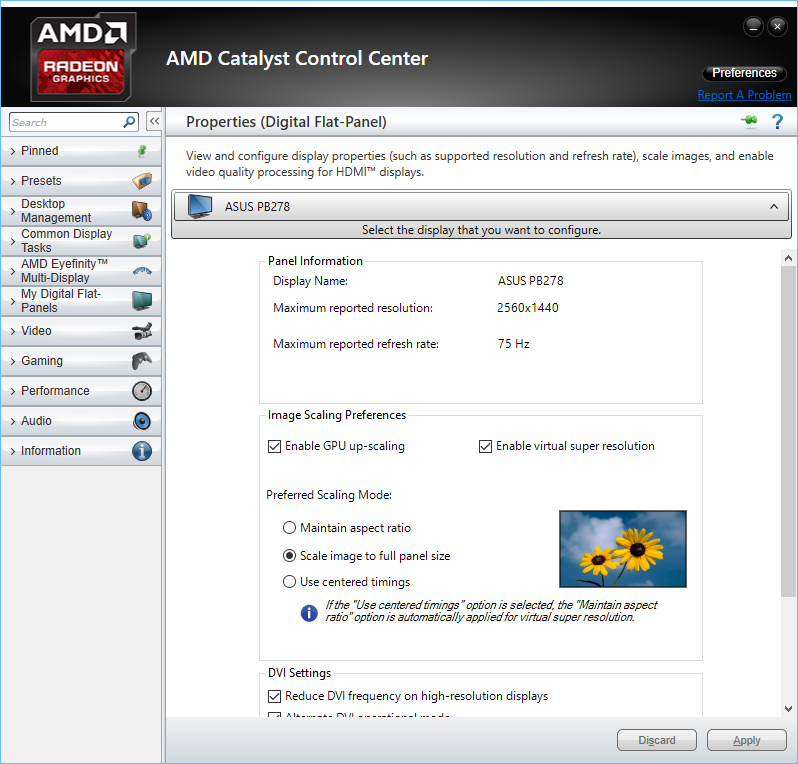 The scaling image option in Intel hd graphics control panel WORKS! But its not a solution. I will play BF4 too. Intel hd graphics is not good for bf4. So, as you can see, im not making this harder. This problem is appear to be on catalyst driver. (i think). Maybe geforce driver have the same problem too, but intel hd graphics driver and microsoft standard vga driver (from windows 10) dont have this problem. Love it! Very glad to hear!